Economics has been dubbed the “dismal science” since Thomas Carlyle coined the phrase in 1849. The 2008 presidential candidate who said, “Economics is something that I’ve really never understood,” probably sides with this view. So, why is economics so dismal to so many? Is it because it has become too mathematical? Is it because traditional textbooks fail to connect topics and models in a concise, cohesive, and meaningful way? Is it because the computer simulations that are used to teach economic principles “stifle students’ imagination, contribute to a dependent learning style, and fail to stimulate interest in the subject matter” (Wetzstein 1988)? Or, is it because economists from different schools of economic thought rarely agree on anything? 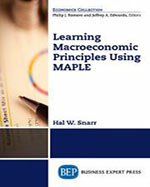 This book uses Maple to make teaching or learning economics more favorable. Maple is ideally suited for this because it allows users to assemble and systematically combine the various models that form the aggregate market model, frees users from doing tedious calculations and algebraic manipulations, and is as easy to use as Microsoft Word. Building and analyzing the macroeconomic model using Maple is a fun way to learn the dismal science of economics.